Source: Diabetes & Heart Healthy Meals for 2. 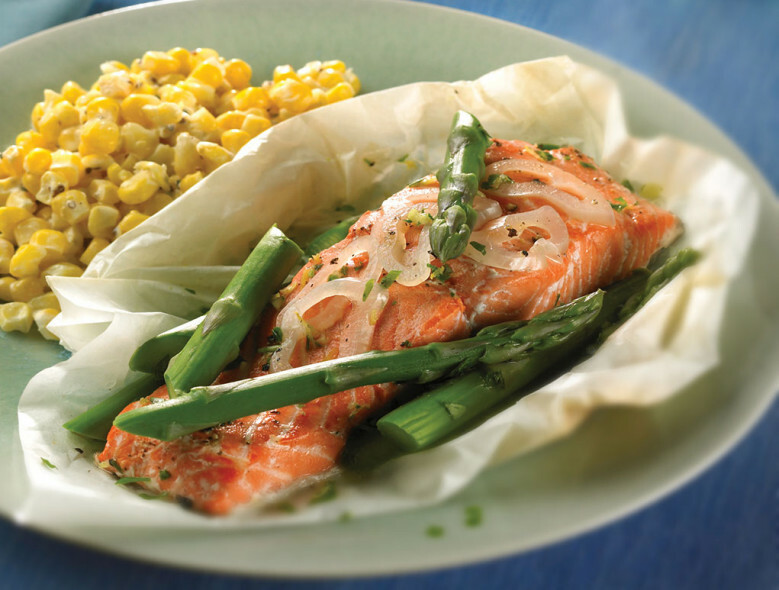 Parchment paper packets are a simple and elegant way to steam fish along with vegetables and seasonings. If you don't have parchment paper, you could use aluminum foil instead. Make extra gremolata and use it to add zest to steamed vegetables or baked chicken another night. Cut off a 15 x 10-inch sheet of cooking parchment and fold in half to for a 7.5 x 10-inch rectangle. Starting at the bottom of the fold, cut into a half-heart shape. Open and spray with cooking spray. Repeat with a second sheet. Place one filet of salmon skin side down centered on half of each parchment heart. Top each filet with half of the shallots, pepper, and asparagus. Fold the other heart halves over the fish and asparagus. Seal each packet by forming a small fold at the top of the heart and continuing to fold the edge until reaching the bottom. Twist the point to shut tightly. Place the sealed packets on a baking sheet, and bake for 10 minutes. Meanwhile, make the gremolata: finely chop the parsley and garlic together. Add the lemon zest, and continue chopping until well blended. Remove the parchment packets from the oven. Let stand for 3 minutes. Being careful to prevent steam burns, cut an X in the center of each packet. Test to be sure the salmon flakes easily when tested with a fork. If necessary, return the packets to the oven for 1 to 2 minutes to finish cooking. Transfer packets to a plate and open the rest of the way. Sprinkle each with 2 teaspoons of gremolata.